The World Health Organizations earlier this week released new statistics on the global epidemic of diabetes. Diabetes mellitus has been recognized as a disease throughout human history for thousands of years. The ancient Egyptian medical text Ebers Papyrus, written around 1550 B.C. first described this condition of ‘passing too much urine’. Around the same time, ancient Hindu writings note the disease of madhumeha, loosely translated as honey urine. Patients were mysteriously wasting away, but curiously, ants were attracted to their urine. By 250 B.C. Greek physician Apollonius of Memphis (I should start referring to myself as Jason of Toronto, so cool…) termed the condition ‘diabetes’ which, by itself connotes excessive urination. Thomas Willis added the term ‘mellitus’ meaning ‘from honey’ in 1675. Another much rarer form of diabetes was termed diabetes insipidus, meaning ‘bland’. This disorder is also characterized by excessive urination, but the urine is not sweet. The primary cause of diabetes insipidus is brain injury, most commonly from trauma or neurosurgery. Commonly, the term diabetes refers to diabetes mellitus. We will also use the term diabetes to mean diabetes mellitus. A more complete description of diabetes mellitus would wait until the 1st century AD when Greek physician Aretaeus of Cappacdocia wrote the classic description of type 1 diabetes as a “melting down of flesh and limbs into urine”. This captures the essence features of this disease in its untreated form. There is excessive urine, but also complete wasting away of all tissues. Patients cannot gain weight no matter what they eat. He further comments that “life (with diabetes) is short, disgusting and painful” as there was no effective treatment. Lovely. The classic method of diagnosis was to taste the urine of the afflicted patient for sweetness. In 1776 Matthew Dobson (1745-1784), the English physician identified sugar as the sweet tasting substance in the urine. Like that was really hard to figure out. He also figured that the sweetness of the blood (oh, that is sooo gross) was also due to sugar. In 1797, Dr. John Rollo a Scottish military surgeon was the first to apply a dietary solution. He observed improvement in a diabetic patient treated with an all meat diet. This would be the first dietary treatment of its kind. By contrast, French physician Pierre Priorry (1794-1879) advised diabetics to eat large quantities of sugar to replace that lost in the urine. A diabetic colleague unfortunate enough to follow this advice died. Needless to say, history only laughs at the good Dr. Priorry. Apollinaire Bouchardat (1806-1886) sometimes called the founder of modern Diabetology, established his own diet based upon his observation that periodic starvation during the 1870 Franco-Prussian war resulted in less glucose in the urine. His book De la glycosurie ou diabète sucré, laid out forbidden foods such as sugars and starches. In 1889, Joseph von Mering and Oskar Minkowski finally identified the pancreas as the culprit organ. Experimentally removing the entire pancreas from dogs rapidly led to identical signs and symptoms of diabetes. In 1910, Sir Edward Sharpey-Schafer proposed that deficiency of a single hormone he called insulin was responsible. The word insulin derived from the Latin insula, meaning island as this hormone was produced in the islets of Langerhans in the pancreas. In 1910, Frederick Madison Allen (1879-1964) developed the “Allen starvation treatment” which was widely considered the best dietary therapy until the discovery of insulin. This diet was very low in calories (1000 calories per day) and very restricted in carbohydrates (<10g per day). Mason’s book “Studies Concerning Glycosuria and Diabetes” revolutionizes diabetes treatments. Patients admitted to hospital are treated with whiskey and black coffee every two hours from 7 am to 7 pm. This is continued until the sugar disappears from the urine. Why whiskey? Not really sure, but I have the feeling that back in the day, they though whiskey could cure just about everything. At least it’ll keep their minds off the fact that they’re not getting anything but whiskey and coffee. While type 2 diabetics do well, type 1 diabetics often die. Since the disease was otherwise fatal, this was not the tragedy it may initially appear. But the response of type 2 diabetics was a stunning improvement, unlike anything seen previously, and Allen soon becomes director of diabetes research at the Rockefeller Institute. He and Dr. Elliott Joslin were considered the pre-eminent diabetic specialists of their era. Dr. Joslin writes in 1916, ‘That temporary periods of under-nutrition are helpful in the treatment of diabetes will probably be acknowledged by all after these two years of experience with fasting”. Frederick Banting, Charles Best and the other guy (John MacLeod) made the breakthrough discovery of insulin at the University of Toronto in 1921. They isolated and purified insulin from bovine pancreases and gave it to the first patient in 1922. 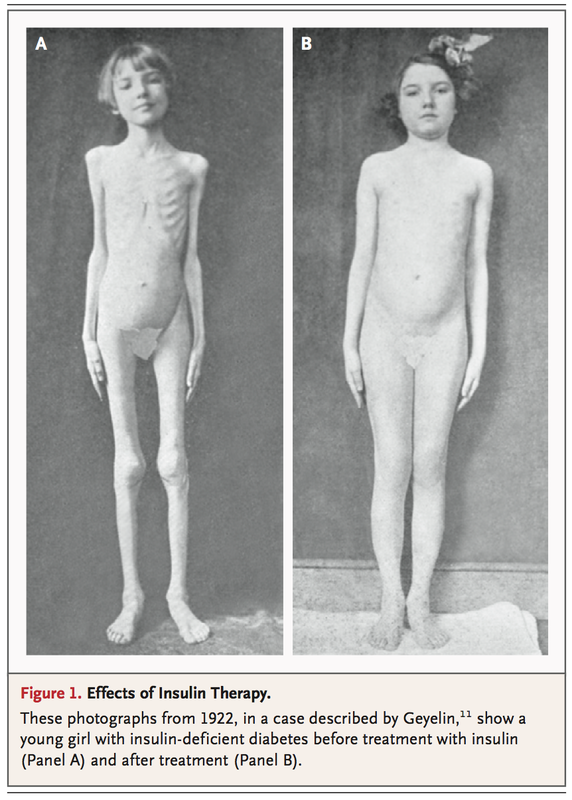 Leonard Thompson, a 14-year-old boy was only 65 pounds when he started insulin injections. His symptoms and signs rapidly disappeared. Six more patients were quickly treated with equally stunning success. The average lifespan of a ten-year old at diagnosis increased from 1.3 years to 35 years! Eli Lilly and Company partnered with the University of Toronto to commercially develop the product. Banting and Best made the patent freely available so that patients worldwide could benefit. By the fall of 1923, 25,000 patients were being treated with injected insulin. Banting and MacLeod received the Nobel Prize in 1923 to commemorate their historic discovery. Later, Sir Frederick Sanger would receive a 1958 Nobel Prize for his work decoding the amino acid structure of insulin. Euphoria ensued. It was widely believed that the cause of diabetes had been discovered and a cure now existed. Urine testing for glucose is refined. New types of insulin are developed. Insulin’s discovery completely overshadows the dietary treatments of the previous century. But it is clear that two groups of diabetics exist. In 1936, Sir Harol Percival Himsworth (1905-1993) divides diabetics based on ‘insulin sensitivity’. By 1948, Dr. Joslin speculates that large numbers of people have undiagnosed diabetes and that insulin cannot solve all their problems. By 1959, two types of diabetes were now formally recognized. These were called type 1 ‘insulin-dependent’ and type 2 ‘non-insulin dependent’ diabetes. With further understanding, the names insulin-dependent and non-insulin dependent are formally dropped in 2003. Previously, the names juvenile and adult-onset diabetes were also used. However, since type 1 diabetes may occur in adults and type 2 diabetes is increasingly prevalent in children, this classification has also been abandoned. What is ironic is that despite the wealth of knowledge accumulated in the last two centuries, we are arguable worse off with diabetes than in 1816 (8). In the 1800’s, type 1, or severe insulin deficiency dominated the landscape. While almost uniformly fatal, these cases were still relatively rare and diabetes was not in the top 10 causes of death. Fast-forward to 2016, and type 1 diabetes only makes up 10% of the total cases. These cases are efficiently treated with insulin. Type 2 diabetes dominates and is growing to epidemic proportions. Almost all these patients are overweight or obese and will suffer complications related to their diabetes. Worse, the prevalence of T2D is a recent phenomenon, having occurred only in the last 30 or 40 years. 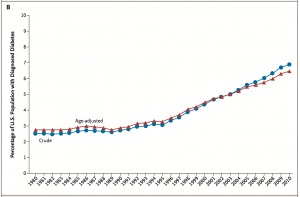 In China, the prevalence has skyrocketed from less than 1% in 1980 to 11.6% in 2010. That’s over a 1160% rise within a single generation! 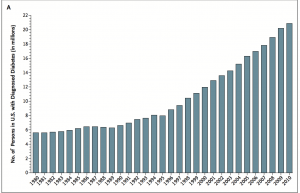 Both the total numbers of diabetics and the percentage of the population (age adjusted) are rising. What’s worse is that there seems to be no end in sight. The problem is not trivial. In 2012, it is estimated that diabetes cost $245 billion in the United States due to direct health costs and lost productivity (10). 14.3% of US adults have T2D, but the problem is even worse than it seems. A full 38% of the population has prediabetes, so the total of prediabetes + diabetes is 52.3%. This means that for the first time in history, there are more people with the disease than without. Unbelievable. Part of the increasing prevalence results from the fact that we are seeing T2D in younger and younger populations. Pediatric clinics, once the sole domain of T1D, are now overrun with an epidemic of T2D patients – often obese adolescents. This is a worldwide phenomenon. In Japan, 80% of all new cases of diabetes are T2D. But the question still remains WHY? Why are we powerless to prevent the occurrence of T2D? Why are we powerless to prevent its spread to the pediatric age groups? Why are we powerless to stop the ravages of T2D on our bodies? Why can we not prevent the heart attacks, strokes, blindness, kidney disease, and amputations that accompany T2D? More than 3000 years after its discovery, WHY IS THERE NO CURE? The only possibility is that we have fundamentally mis-understood the disease called T2D. We must understand the causes of the disease to cure it. In medical terms, this is the aetiology. What is the aetiology of T2D? Once we understand that, we can begin to design rational treatments that have a chance of success. I’m very pleased with your book Jason. Keep up the, necessary, good work. In addition antibiotics poison mitochondria exacerbating metabolic problems. Coming in late here, but bingo. Agreed. It’s also interesting that when diabetes doubled in China, it did so about the time the sad diet (haha) (standard American diet) introduced itself to China. Also interesting is that Our bodies can use ketones (not the kind that happens to uncontrolled diabetes) if little to no carbs in diet, which means our bodies can thrive without carbs. I believe the food pyramid is a disaster and should be flipped. Medicare recently authorized a creative new diabetes prevention benefit that leads to better health results and significantly lower costs. The core technological driver is talking and coaching at the YMCA. The Incidental Economist/New York Times has details. Now, if only a few of these coaches have ever heard of Jason of Toronto. Thank you for your reply… Good to know your experiences… Thanks! Allison, Fruit is sugar and most yogurts are full of it. I couldnt find a yogurt without carbs so had to give it up. check the carb content. If i ate fruity yogurt and oatmeal my first two meals i would be starving all day. Eliminate those and have bacon and eggs for breakfast. If you get your body into fat burning mode by cutting carbs you wont be hungry. Let’s call it what it is. Processed Food Disease. I do not understand the potato hack diet. 5lbs of potato is 1769 calories and 390 grams of carbs. For me eating just 100gr will bring my sugar up for half a day (cannot imaging what 5lbs would do to my BS). For me eating under 1000 calories a day with less 20 grams of carbs is the way to go. Hi JIn, so everyday way of eating is low carb and you added some interruptions of a day or two of only potatoes? How many calories in a potato day compared with a low carb day? How many potato days in a week? michelle, are you getting enough sleep? is your sleep quality good? might you have apnea? are there significant stresses that might be raising your cortisol levels? do you have truncal obesity and thin limbs? [this could be cushing’s disease] has your tsh [thyroid stimulating hormone] level been checked? Why whiskey? Not really sure, but I have the feeling that back in the day, they thought whiskey could cure just about everything. It turns out that gin (similar to whiskey) has the lowest insulin index. I couldn’t read it due to it being behind a login wall. Here is the same news story but you wont have to subscribe to read it. They (i.e. mainstream media / medical profession) just can’t see the forrest for the tree’s. when i was in medical school, it was still called “adult onset.” now there are 8 year olds getting diagnosed with type ii diabetes. i was at a conference of the american society of bariatric physicians [the internists and pediatricians, not the surgeons, and now called “obesity medicine” society] and a speaker asked for a show of hands of docs who’d been called to e.r.’s to rule out heart attacks in teenagers. there were 6 in the room.